Once you've performed a manual virus scan or two, you will most likely want scans to be an automatic process with little or no input on your part. Fortunately, Microsoft Security Essentials (MSE) allows you to schedule virus scans on your Windows PC. In this guide, we will show you how to set-up MSE so that you can have virus scans run automatically and stop worrying so much about your computer's safety. Select the Settings tab in Microsoft Security Essentials. Check Run a scheduled scan on my computer (recommended). Quick - This scan will be quick and only scan the sections most likely to contain malware. That means MSE may not be able to find more pernicious viruses and malware lurking deep in your computer. Full - The full scan is the best option if you have not done a security scan on your Windows machine in a while. It is also a good option if you are scheduling the scans to take place when you are not using the computer. Custom - This option allows you to set specific parameters like where you want to scan and the level of the scan. This is a great option if you have an external hard drive or a memory key you wish to scan along with your computer's regular drive. The next option lets you decide when the scan should take place. The options are to do it every Monday, Tuesday, Wednesday, Thursday, Friday, Saturday, Sunday, or daily. Once a week should suffice for most PCs; however, if there are a lot of people who use the computer, or if you spend a lot of time checking email and surfing the web, it may be a good idea to run a scan every day. The Around dropdown menu provides you with a list of every hour in the day. Select the time that best suits your schedule. If you don't plan to use the computer past 10 PM, for example, then schedule the scan to take place shortly after that time. Choose whatever time fits your schedule. You can always schedule the scan to occur during the day while you are using the computer, but this will most likely hinder performance—although we can decide by how much (see below). Check for the latest virus and spyware definitions before running a scheduled scan: When selected, Security Essentials will check to see if there are any additional spyware definitions ready for download before beginning a scan. This is a critical setting, and it is absolutely recommended that you enable it. Start the scheduled scan only when my computer is on but not in use: If the scan is scheduled for 10 PM, but you are still using the computer, the scan will not begin until the computer is idle again. A very nice feature that makes sure any virus scans don't interfere with your use of the PC. Limit CPU usage during scan to (select percentage from the drop-down): This is the option that helps determine how many resources will be dedicated to scanning the computer for malware. The lower the value the less of an impact the virus scan will have on the work you are trying to accomplish on your computer; however, a lower value will also slow down the scan. If you increase the amount of resources available, on the other hand, the scan will take less time but carrying out tasks on your PC will take that much longer. Tip: You should only use CPU limiting option if you plan to use the computer while the scheduled scan is in progress, otherwise uncheck this option. Once you've made your selections, select Save changes. Note: You may be prompted to confirm the changes by User Account Control. Select Yes to confirm. 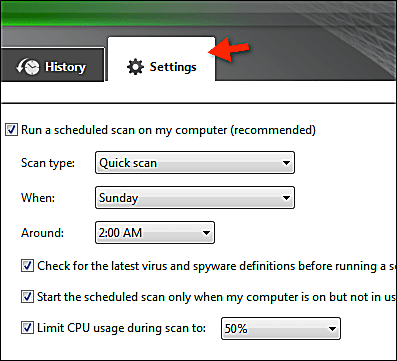 Once it's all set up, Microsoft Security Essentials will scan your computer at the scheduled times you assigned. Even though you have a scheduled scan running either every day or on a weekly basis, it's still a good idea to run a manual scan every now and then to make sure your PC is running smoothly. What is the Microsoft Security Bulletin Severity Rating System? What's an EZT File and How Do You Open One?